Joseph Henzey was a competent, successful Quaker craftsman. Henzey was born about 1743 and p[robably completed his apprenticeship in the mid 1760s. The earliest record of his working career occurs in the 1767 assessment, which indicates that he paid only a 2s. head tax because he was both unmarried and without taxable property. He was either beginning his own business or working as a journeyman. Henzey began to sell Windsor furniture on his own account by 1772, when he married and also took two apprentices. 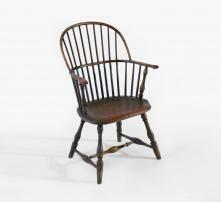 Both boys, Isaac Covert and David Stackhouse, the latter a Bucks County Quaker, later established their own chairmaking businesses. By the early 1790s Henzey was also a steward of Pennsylvania Hospital. At Henzey's death in 1796, Quaker cabinetmaker Daniel Trotter provided his coffin. Click here to read the entire article from Herb Lapp written for the American Furniture Society in 2008.